Office laptop for tight budgets. Lenovo introduces the Edge E335 from its well-known ThinkPad range for particularly tight budgets. The following review will clarify whether the entry-level business machine, priced at a low 459 Euros (~$589), is also compelling. 459 Euros (~$589) for a Lenovo ThinkPad - that is a price challenge meant for the competition in the business laptop sector. 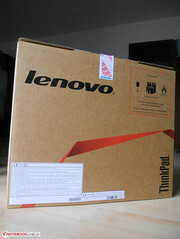 The ThinkPad range from the Chinese computer giant, Lenovo, is still a synonym for high-end and robust business laptops as known from former IBM times. In addition to high-priced professional devices, such as the recently reviewed ThinkPad T430s, the Asian PC manufacturer is increasingly expanding it assortment in the low-budget sector with affordable entry-level business laptops. 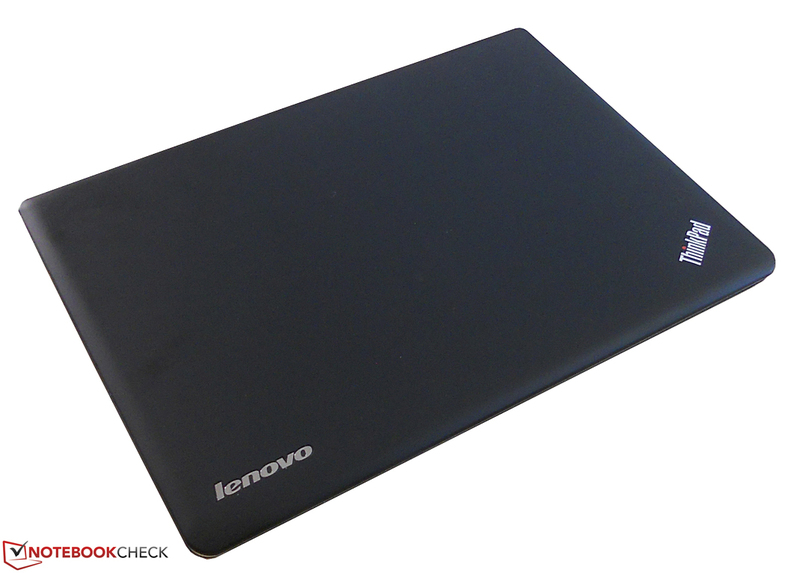 After the E330 sister model went through the extensive Notebookcheck test-course, we now put the virtually identical brother, Lenovo's ThinkPad Edge E335, through its paces. 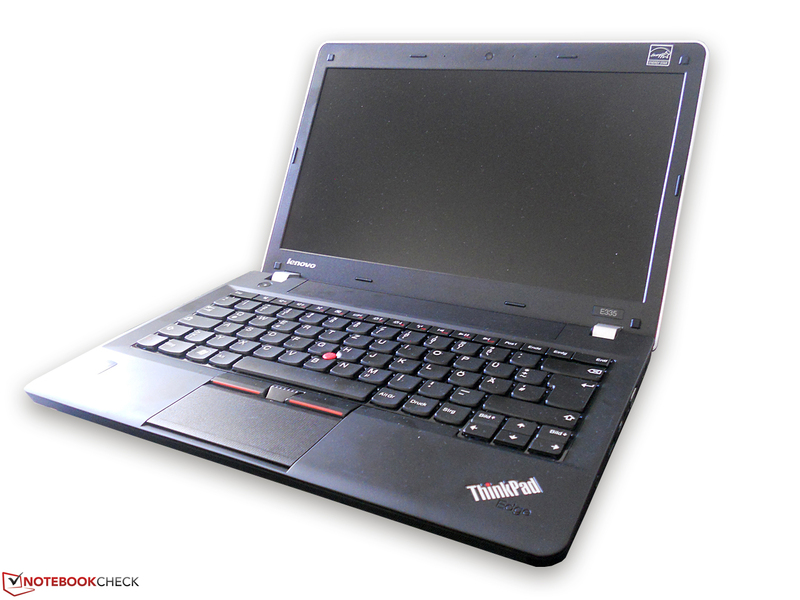 Unlike most laptops and its E330 sister model, the ThinkPad Edge E335 is not equipped with a processor from the undisputed market leader Intel. Instead, it sports a CPU and GPU from AMD. A matte 13-inch screen, the usual 4 GB of working memory and a sufficiently sized 320 GB hard disk round off the work device, currently listed with a price of 459 Euros (~$589). 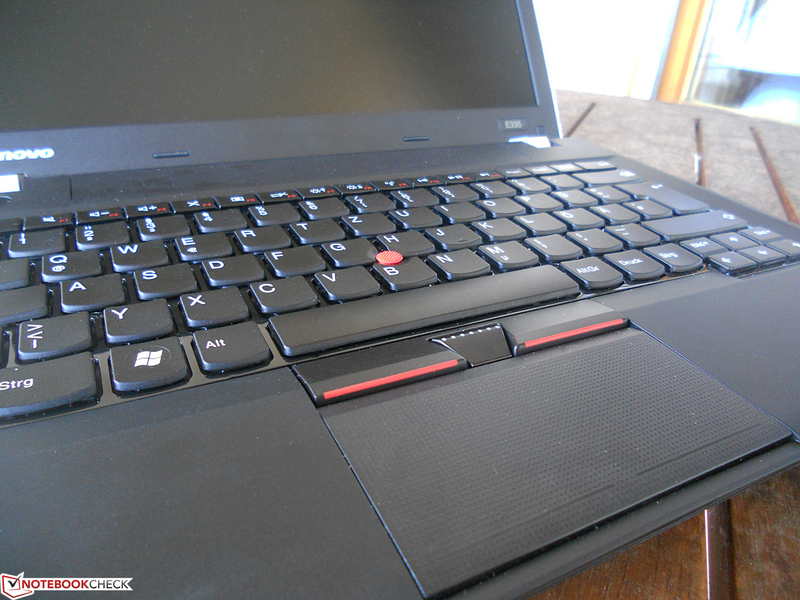 The ThinkPad Edge E335's casing is completely made in the typical, classic and simple ThinkPad design of gray plastic. However, it does not convince with the highest quality and robustness to the same extent as its bigger brothers. Especially in areas with a lower material thickness or in material transitions, we discover minor workmanship flaws like uneven gaps in some places or lower-quality plastic. However, we also have to note that we are complaining on a high level in view of this price range. The device nevertheless leaves a surprising and absolutely satisfactory as well as ThinkPad typical robust quality impression, especially considering the very low price. Compared with the Edge E320 precursor, not much has changed regarding the casing. The silver hinges are not made of solid metal but are rather merely plastic covers. They do their job flawlessly on our test device and keep the display lid firmly in place and only allow it to rock marginally. The rubber-coated display lid is also a bit unusual. On the one hand it gives the laptop a non-slip texture but on the other, it is unfortunately also extremely susceptible to dust and fingerprints. The base unit proves to be quite solid in terms of stability and pressure resistance. Thus, the casing first dents slightly under higher pressure and only in a few places. It wins points with a better stability and stiffness than the E320 although you must not expect the build quality or robustness of a full-blown and expensive ThinkPad. 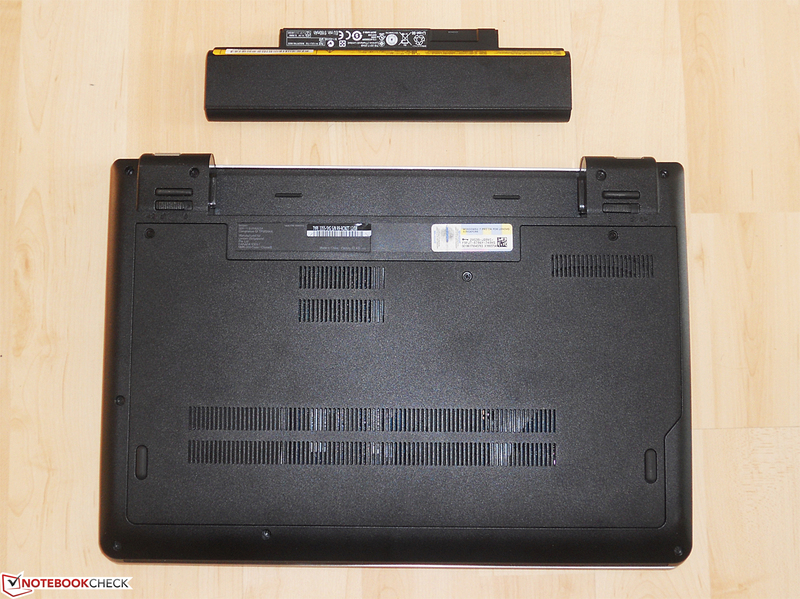 In return, the base unit of the 1.8 kg (~4 lbs) 13-inch laptop is so light that it lifts when it is opened with one hand. This is due to the battery, which is positioned between both display hinges at the rear. Unlike the current popular trend of fixed batteries, it can be removed and exhibits a slightly wobbly fit. Nevertheless, it fits tight enough in its compartment. Overall, the ThinkPad Edge E335's casing makes a good and robust quality impression, as did the E330, and is one of the ThinkPad Edge E335's specialties. Lenovo's business laptop deals with the part about connectivity quiet well and supplies the user with virtually all important and significant interfaces. The entry-level business laptop comes with a total of 3 USB ports (2x USB 3.0, 1x USB 2.0), an Ethernet port (RJ45), a card reader, a microphone/headphone jack and both the HDMI and analog VGA standard for connecting external monitors. Some users will miss a DVD drive a bit but this is also a current trend and it is omitted on an increasing number of new laptops. 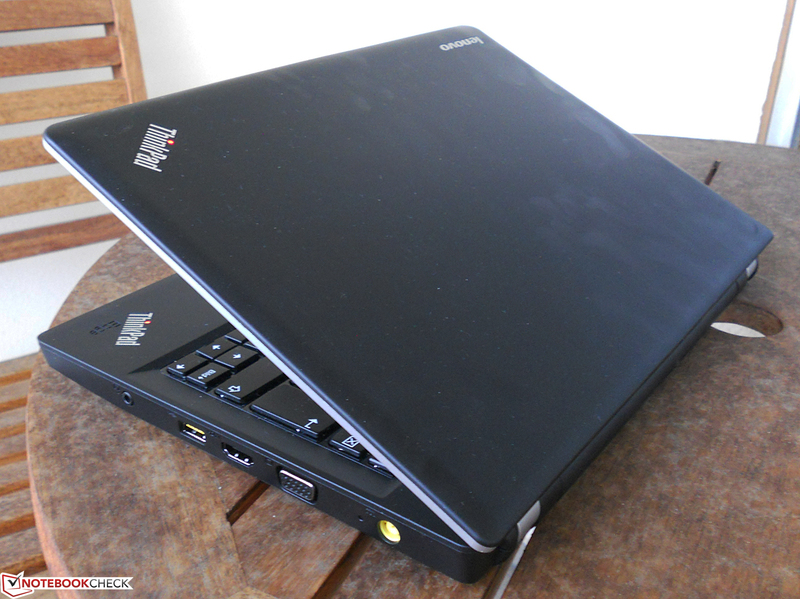 The interfaces are distributed on both sides of the laptop's casing. The display's mounting at the rear and the battery's position between the hinges prevents installing interfaces there. The laptop's front does not sport any ports either. The favorable interface distribution on both sides as well as the sufficient room between the single ports prevents a cable mess and allows the port to be used comfortably. Merely the LAN port's position on the left might be a bit adverse especially for left-handed users. Communication does not come too short in Lenovo's ThinkPad Edge E335. Expected standards, such as an Ethernet port for cabled and Wi-Fi for wireless access to the World Wide Web, are just as present as a Bluetooth interface for wireless data transmission. There are not many accessories included for Lenovo's entry-level business laptop. In addition to the laptop itself, there is a 65 Watt PSU and a quick start guide with the most important information. Windows 7 Professional 64-bit is pre-installed on the laptop. 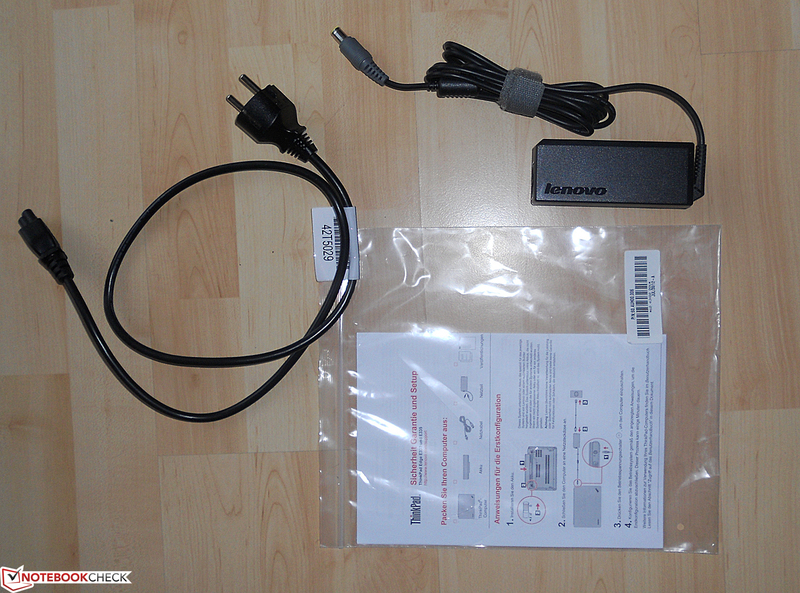 The buyer can find more detailed information in the form of electronic manuals on Lenovo's website. A recovery DVD is not included in the scope of delivery - which is logical since there is no corresponding drive. Instead, Lenovo relies on a recovery partition on the laptop's hard disk, like most manufacturers. 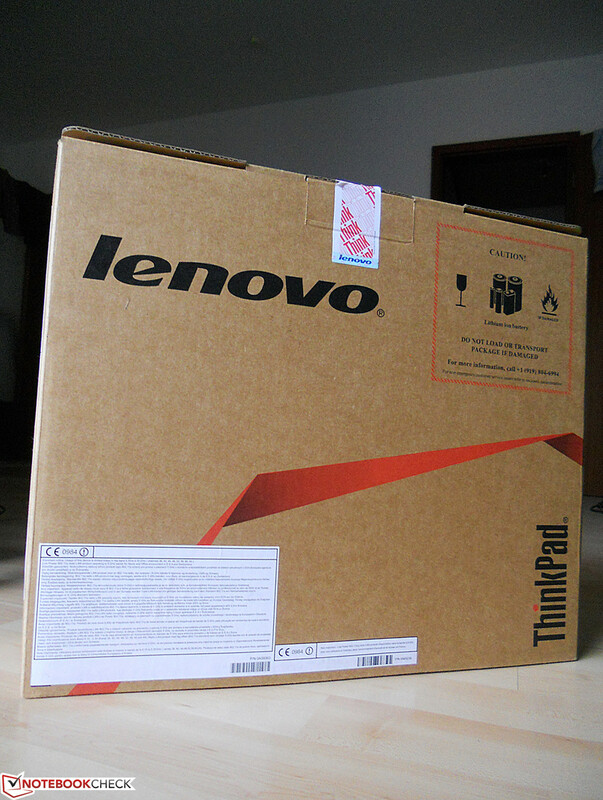 Lenovo only includes the now standard 12-month warranty on a bring-in basis for its ThinkPad Edge E335. However, the warranty can be upgraded to either 2 or 3 years including on-site service for a surcharge. These options cost 49.74 Euros (~$64) for 2 years up to 192.18 Euros (~$247) for 3 years, including the on-site service as well as accidental damage protection. The ThinkPad models have a good reputation for their input devices and high build quality. This is also the case in the ThinkPad Edge E335, with a few exceptions. The low-budget model's keyboard is compelling. It features a fairly long drop and a crisp as well as defined stop, which gives the E335's chiclet keyboard a very good and clear feedback. Its typing characteristic is similar to that of a standard computer keyboard. We thus have to categorize the splash-protected keyboard's typing feel as pleasant. It was very impressive in the test subjectively. We are used to more severely clattering and cheaper-looking keyboards in much higher-priced laptops. The touchpad did not quite continue the keyboard's good impression. The touchpad, implemented as a rocker without dedicated (lower) mouse keys, was not completely convincing. In particular multi-touch gestures were not always detected without problems. The touchpad's surface area is a bit small and thus limits its user-friendliness to an extent. In return, its gliding traits are good and the lightly textured, roughened surface creates a pleasant feeling. 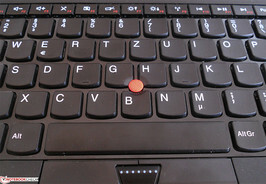 The mouse buttons located above the touchpad and the TrackPoint implemented in the keyboard is typical for business laptops and particularly for the ThinkPad models. Like the keyboard, the mouse buttons provide good feedback with a relatively long drop, which makes them pleasant to use. The control of the red, non-slip TrackPoint, which is an alternative to the touchpad for navigating the cursor, will be a bit unusual for newbies and is certainly a matter of taste. However, it will very likely find its fans after a while of familiarization. The first thing that will strike you about Lenovo's ThinkPad Edge E335 is its matte screen coating. A matte screen belongs to the absolute and continuous standards of various ThinkPad models, but is certainly not so for the masses in the vast notebook market. This proves to be a clear advantage over the glossy screens found in many laptops especially in outdoor use or in bright rooms, although matte screens belong to the standards particularly in the business sector. The other screen specs of Lenovo's ThinkPad Edge E335 only belong to the broad average. The buyer gets a low-budget TN screen that has the usual resolution of 1366x768 pixels. For a good display quality, especially outdoors or in brighter surroundings, other factors like screen brightness are naturally also important. An average value of 189 cd/m2 in maximum brightness settings is rather moderate and especially makes working in the sun very difficult. The low-reflection, matte screen cannot completely compensate for this either. However, the screen's brightness is sufficient in the shade and the matte coating contributes to the screen's acceptable legibility. A black value of 1.29 cd/m2 results from the measured, below-average contrast of 171:1. This can also only be seen as average and expresses itself in an unsatisfactory dark-gray rather than a saturated black reproduction. 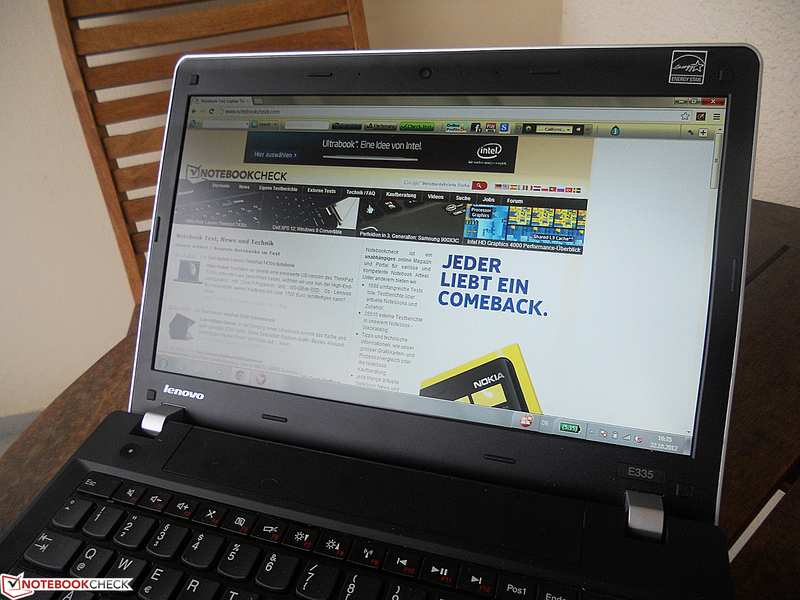 Regrettably, the ThinkPad Edge E335's screen also subjectively lacks contrast, crisp and brilliant colors. It generally makes a fairly pale impression. The color gamut measurement showed that the E335's screen does not come close to covering the large sRGB color space. However, we have to point out that only few and more expensive premium screens achieve this and that it is more significant for professional picture editing. 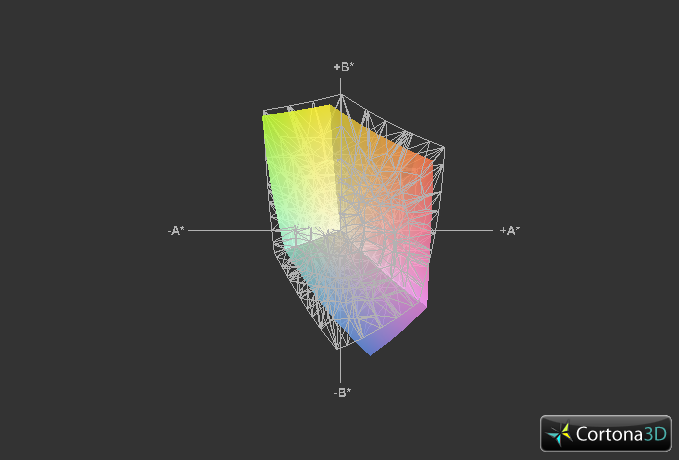 Compared with the previous ThinkPad Edge E320 model's screen, the screen in the E335 achieves similar color space coverage, while our test model's screen is almost identical with the bigger ThinkPad L430. We also looked at the LG Philips TN screen's viewing angles. Again, technical excellence cannot be expected here. Looking at the screen in Lenovo's ThinkPad Edge E335 confirms this. 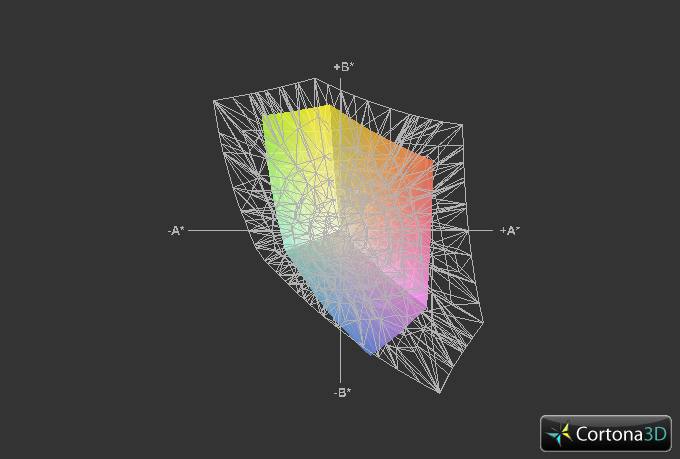 Colors clearly distort particularly on the vertical plane, i.e. looking down or up at the screen from an angle, and falsify even more the acuter the angle gets. This phenomenon, especially common for lower priced TN screens, is not as severe in horizontal viewing angles. However, it is generally noticed to a very visible extent. Although this does not have to be the only make-or-break criterion for a screen, there are definitely situations in which an imperfect view on the screen might mar enjoyment, e.g. on a plane or when several people are sitting in front of the laptop, etc. This results in an only average rating alongside the screen's unfortunately merely mediocre image quality in terms of brightness and contrast, which you however have to reckon with in view of a price below 500 Euros (~$642). Now we come to the next main category: The computing performance of Lenovo's ThinkPad Edge E335. Unlike the E330 model, the E335 is not powered by hardware components from the market leader, Intel. It exclusively uses computing units from the competitor, AMD. Since we recently sent Lenovo's ThinkPad Edge E330 through our extensive performance tests, we will also use the Intel model for comparison. A brief look at the ThinkPad Edge E335's hardware configuration should however be enough to realize that it is just as little a performance behemoth as the Intel counterpart. 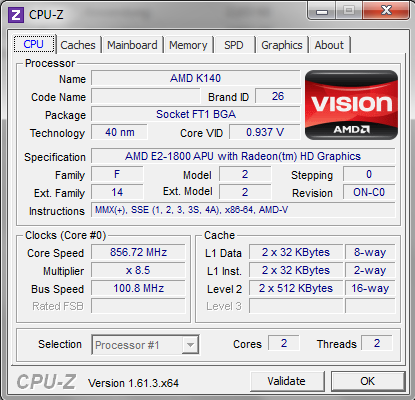 Our test device sports AMD's E2-1800 dual-core processor with a clock frequency of 1.7 GHz. 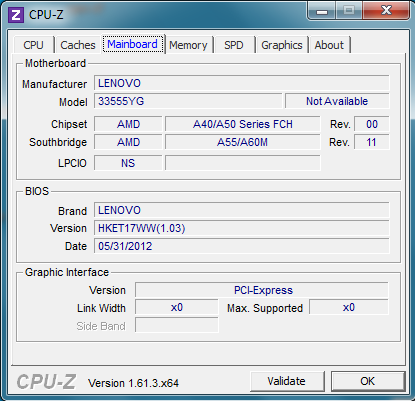 AMD's Radeon HD 7340 is used as the graphics unit in Lenovo's ThinkPad Edge E335. Although its name might suggest that it is a dedicated graphics card, it is a processor-integrated unit like Intel's HD 3000 installed in the E330. 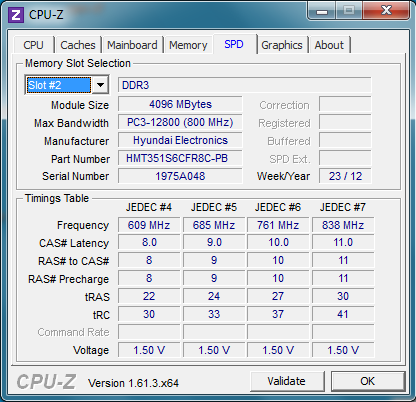 Lenovo installs the widely used and standard 4 GB of DDR3 RAM in the E335. 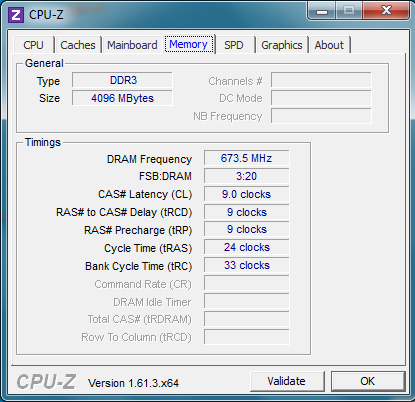 It clocks with 1333 MHz and should completely suffice for routine applications. 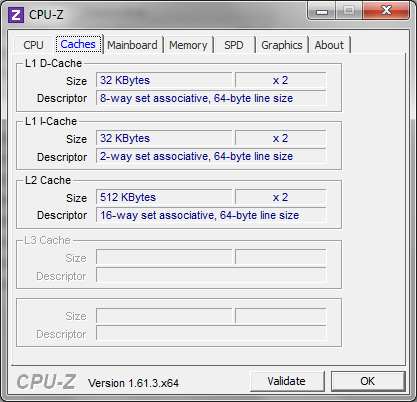 The E335's working memory capacity can be upgraded to generous 8 GB since only a 4 GB RAM bar is inserted in one of the two banks. As usual at this point, we put Lenovo's ThinkPad Edge E335's CPU through its paces in the form of various benchmarks. AMD's E2-1800 dual-core processor has to calculate the well-known Cinebench benchmark programs from the 3D software developer Maxon. As suspected, giant leaps are not possible with AMD's entry-level CPU. This is especially seen when compared with stronger laptops. The scores achieved in Cinebench R10 single and multi-core rendering were only in the lower thousand and two thousand range, which is very slow. 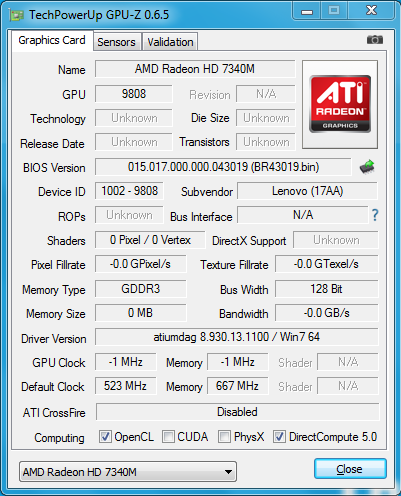 Only very low 8.5 fps were accomplished in Cinebench R11.5 OpenGL 64-bit. AMD's E2-1800 processor has to admit defeat compared with Intel's Core i3-2370M in the ThinkPad Edge E330. Scores, like 1076 points in the 3DMark 06 CPU part, look weak even beside the 2370M's rather low 2868 points. Also, Intel's processor partly has a 300% performance advantage over AMD's CPU in the E335 in the various Cinebench benchmarks. The E2-1800's extremely weak CPU performance does not really suggest fast computing in terms of system performance. In particular the reference programs PCMark 7 and PCMark Vantage from the software developer FutureMark prove that the installed components are only designed and dimensioned for loading the system to a minimum, i.e. browsing or basic office tasks. 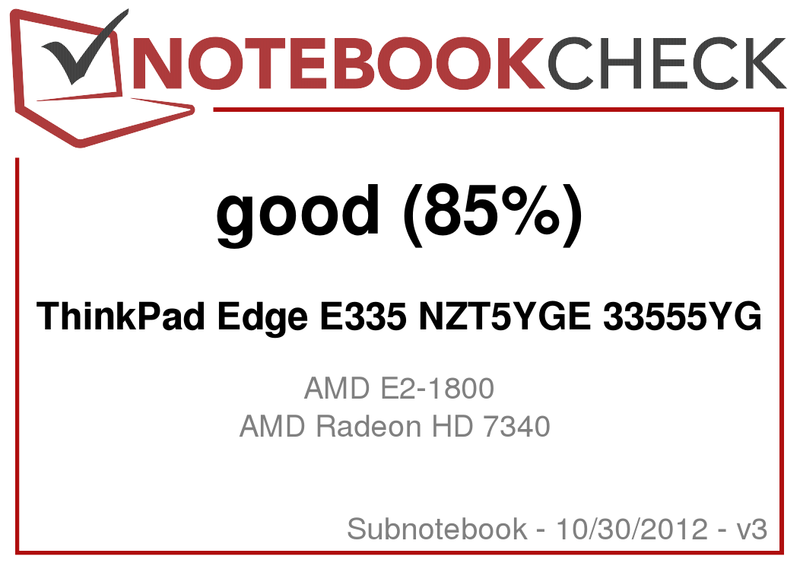 PCMark 7's score of 1093 points is just as low as the much vaster PCMark Vantage in which the ThinkPad Edge E335 reaped in a mere 2529 points. Again, Intel's i3-2370M's clear advantage becomes very evident. It scores better by over 90% and 130% with 2079 in PCMark 7 and 5991 points in PCMark Vantage. Nevertheless, the E335's subjective system performance is absolutely sufficient for simpler office tasks. The advantage of the fast, 7200 RPM HDD and the 4 GB of RAM, which supply enough power for routine tasks, take effect here. The 320 GB hard disk in Lenovo's ThinkPad Edge E335 is a small highlight and can collect a few plus points. The small 2.5 inch hard disk features a memory capacity of 320 GB, which is not exactly large. However, it compensates for that with swift read and write speeds as well as 7200 RPM for more than just acceptable access rates. These also manifest themselves in our synthetic benchmark programs, HDTune and CrystalDiskMark, which put the E335's HDD through its paces. HDTune records a good average data transfer rate of 90.9 MB/s. CrystalDiskMark confirms this good performance. There is no need to mention that a much faster SSD cannot be expected in this price range. 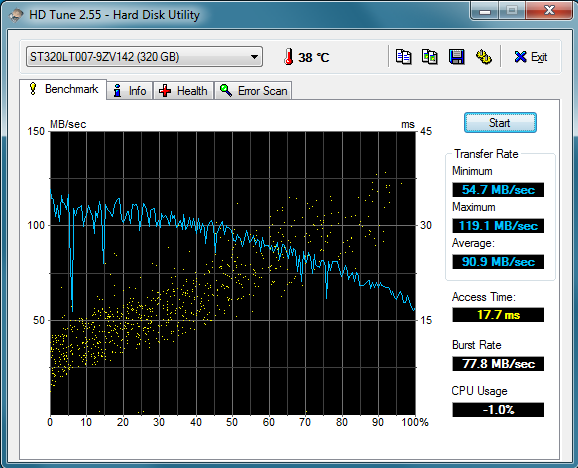 Nevertheless, the installed Seagate hard disk does a good job as a conventional HDD solution. We of course also looked closer at the processor-integrated graphics in the form of AMD's Radeon HD 7340. The CPU-integrated graphics unit faces established reference benchmarks, such as 3DMark 06, the new 3DMark 11 and 3DMark Vantage. The benchmarks reveal the performance potential of AMD's Radeon HD 7340 and confirms what we expected in view of the CPU performance assessments: AMD's E2-1800 chip is simply much too slow for demanding graphics calculations. The same is true for the integrated GPU, which has to use up to 384 MB of the much slower DDR3 working memory since it does not have a dedicated VRAM memory. With 2502 points in the well-known 3DMark 06, which assesses the E335's GPU and CPU performance, AMD's model lags a bit behind the E330 featuring Intel's CPU (3223 points) and indicates a very weak 3D performance. This impression is confirmed when looking at the results in the newer 3DMark 11 and 3DMark Vantage, which are just as low with 362 and 1041 points in the default performance mode. Thus, it is not surprising that the Unigine Heaven 2.1 benchmark only exhibits a sluggish slide show on the screen with an average of 0.9 fps. The gaming performance is extremely poor. The synthetic benchmarks already suggested that Lenovo's low-budget entry-level business laptop is definitely not a gaming machine with its AMD E2-1800 CPU and integrated graphics unit. 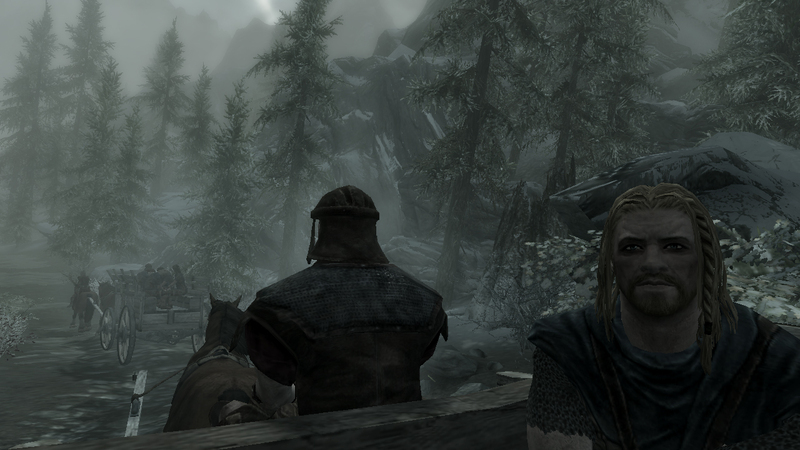 The practical gaming tests confirmed his impression. AMD's E2-1800 integrated graphics is much too slow for all 3D games and consequently absolutely unsuitable for gaming and graphics calculations. Lenovo's ThinkPad Edge E335 cannot cope with older games in minimum setting either. Thus, potential buyers should keep in mind that the laptop is only suitable for basic office tasks and Internet. Even the minimum setting of 34.6 fps in FIFA 13 stuttered extremely and made Electronic Arts' soccer game absolutely unplayable. Lenovo's ThinkPad Edge E335 does an excellent job with the system noise. As usual at this point, we push Lenovo's 13-inch laptop to its limits via Prime95 for 100% CPU load and FurMark for 100% GPU load. The E335 never exhibited signs of stress in terms of noise development despite one and a half hours of full load. We were also surprised that the fan only reached an almost inaudible average of 32.5 dB(A) although it ran permanently at a low speed even when idling. This is particularly due to the very low computing performance. Like in the previous benchmarks, the E335 struggled with the GPU and CPU calculations. Nevertheless, we did not expect it to stay virtually silent over the entire period, in contrast to stronger computers. Thus, the E335 does a good job in this category seeing that Lenovo's laptop technically reaches a higher system load capacity much faster due to its very low performance than almost every other device. 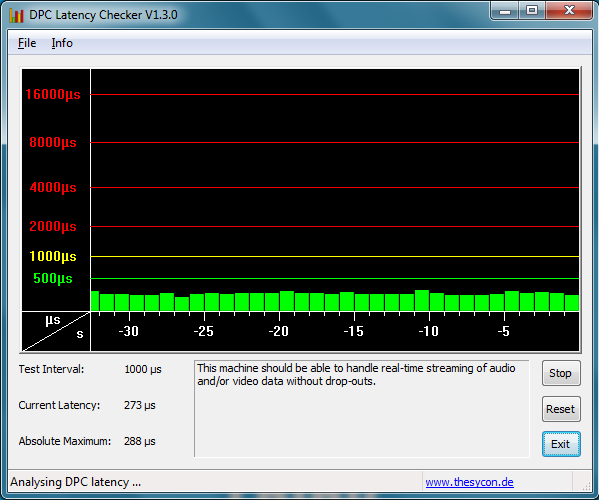 The ThinkPad also remained pleasantly quiet during load with a maximum noise level of 33.1 dB(A). 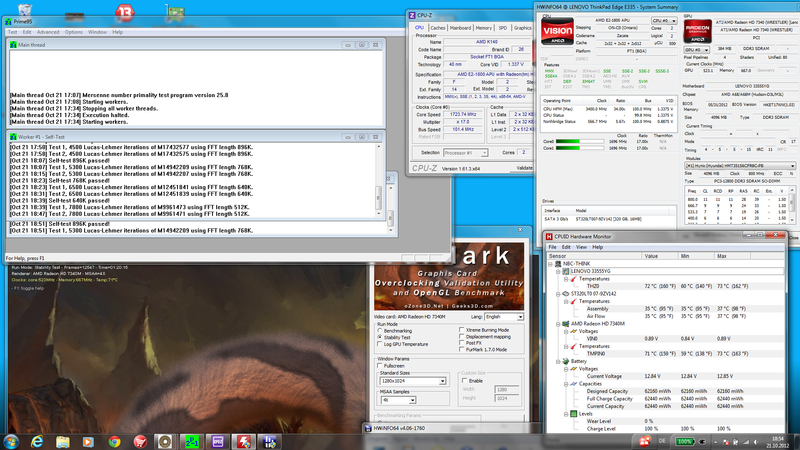 We "torture" the system with Prime95 and Furmark to load the CPU and GPU to the maximum in the stress test. We also used our stress test to ascertain the operating temperatures of Lenovo's ThinkPad Edge E335. The test device virtually never exhibited the applied load during the stress test. This explains why the fan, as described above, never speeds up. The E335's extremely low operating temperature makes any kind of stronger cooling unnecessary. The average temperature of the interior hardware components was merely a fairly low 71 °C (~160 °F). For comparison: powerful hardware (CPU and GPU) frequently heat up to well over 90 °C (~194 °F). Thus, we unlikely have to mention that temperature-related throttling or a similar performance drop was never an issue. The device again collects plus points here although this is again due to the laptop's extremely low performance like in "System Noise". Another positive point is that the casing also stayed very cool and at a pleasant temperature. A very low temperature was perceived even on the "hottest" spots of the wrist rest. 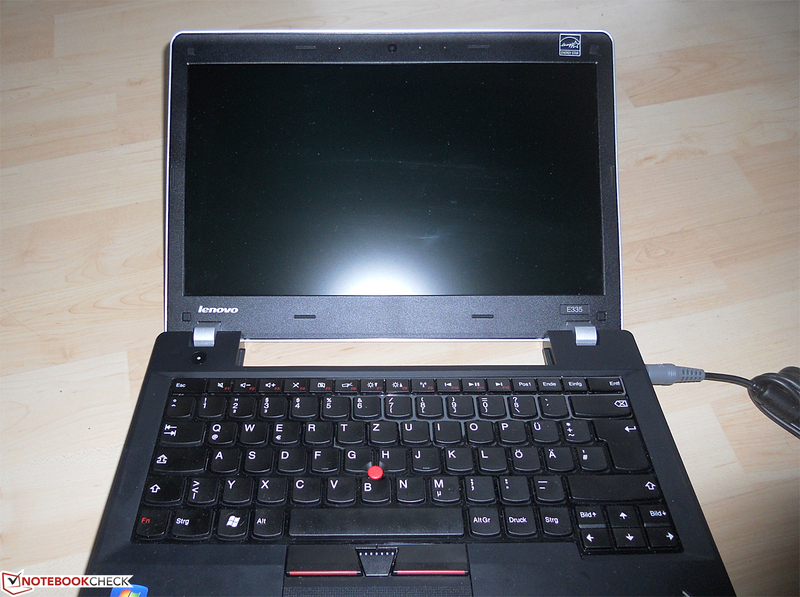 Consequently, Lenovo's business laptop can be easily used on the lap. (±) The average temperature for the upper side under maximal load is 32.3 °C / 90 F, compared to the average of 30.7 °C / 87 F for the devices in the class Subnotebook. (+) The maximum temperature on the upper side is 35.2 °C / 95 F, compared to the average of 35.8 °C / 96 F, ranging from 22 to 57 °C for the class Subnotebook. (-) The average temperature of the palmrest area of similar devices was 28.6 °C / 83.5 F (-3.7 °C / -6.6 F). The ThinkPad Edge E335's speakers, which extend over the laptop's entire front, again belong to the broad average. The speakers in Lenovo's business device however do not make a bad impression, although music and sound are a bit thin and slightly tinny compared with high-quality speakers. The E335's speakers cannot replace the stereo system or the MP3 player because the sound is not clear and strong enough. A difference to the sound quality of higher-quality laptop speakers is very audible. Nevertheless, the speakers in Lenovo's small laptop can be said to have an absolutely acceptable sound quality, particularly in view of this price range and they should satisfy the usual requirements placed on an entry-level business laptop. We also measured the power consumption of Lenovo's ThinkPad Edge E335 in both idle mode and in the more realistic load test. Lenovo's business laptop impresses with very low power consumption here. Our test device consumed an average of a very low 8.1 Watts in idle. This even beats the 9.4 Watts of the equally energy-efficient E330 Intel model. The power consumption naturally climbs during load. The E335's hardware components do not belong to the biggest power guzzlers, again because of the weak computing performance. We ascertained a maximum power consumption of 24.8 Watts in the stress test, which is much lower than the consumption of high-performance laptops. It even undercuts the somewhat stronger E330 with only half of the power consumption. One of the most important points in such a small and handy business laptop is naturally its battery runtime. Lenovo promises a long runtime of up to 7 hours. However, we usually cannot reach these rather optimistic rates, which are typical for manufacturers, in practice. 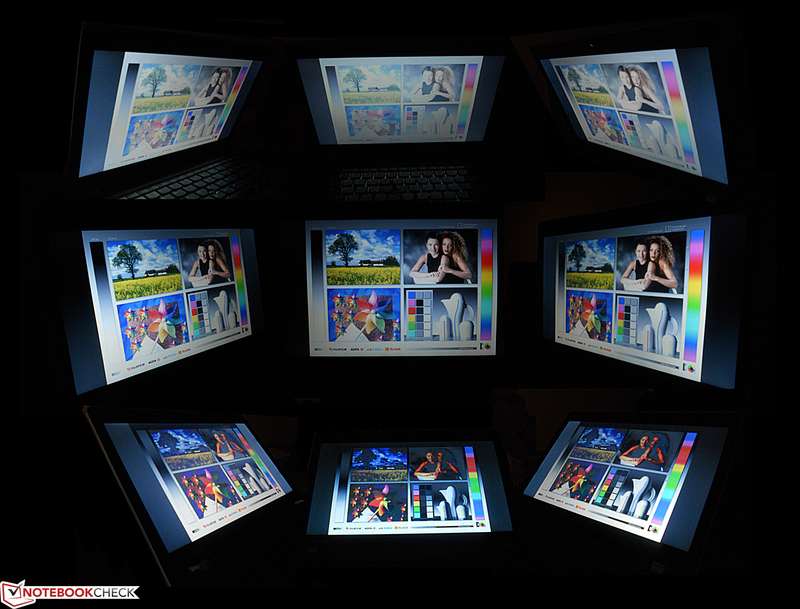 Particularly the screen's fairly low average brightness of 189 cd/m2 takes effect in routine use. It almost always requires the highest of the 15 adjustable brightness levels even indoors. We ascertained the battery life in various application scenarios using the established program Battery Eater. The E335 lasted for 10:49 hours in the unrealistic assessment of the maximum possible runtime in minimum brightness and disabled Wi-Fi. The calculated minimum runtime of 3:09 hours is determined by maximizing load using the corresponding Battery Eater Classic profile and maximum brightness as well as disabled energy-saving options. Our Wi-Fi test provides a very realistic rate. Various websites are visited automatically in medium brightness. It records a good to very good battery life of 5:15 hours for the E335. Lenovo's ThinkPad Edge E335 left us with mixed feelings. Miracles cannot be expected from a low-budget price range of below 460 Euros (~$590). The E335 absolutely confirms this in a few points. As expected, the laptop is far below average, especially in terms of performance. This is acceptable considering that Lenovo aims at small businesses looking for a portable and robust business laptop for as little money as possible. Here, Lenovo's ThinkPad Edge E335 absolutely fulfills the expected and desired core aspects, such as a robust and solid build and a long battery life. A somewhat higher contrast and brighter screen would be appreciated, although there is not much room for complaint in view of the very low price range. The laptop's exceptionally low temperature and noise development, although it quickly reaches high load, reaps in more plus points for the E335. However, this is again the result of the laptop's biggest drawback – it’s very poor computing performance. Basically, Lenovo's ThinkPad Edge E335 is well-designed for the targeted low-budget business group. Users who expect a fairly acceptable computing performance from their laptop should rather look at the E335's Intel model, the ThinkPad E330. It has clear advantages, especially in terms of system performance, and is still within a very affordable low-budget range at 569 Euros (~$730). Alternatively, the next higher ThinkPad category (e.g. L430) also offers higher-quality but still affordable business laptops. Lenovo's ThinkPad Edge E335 in review. 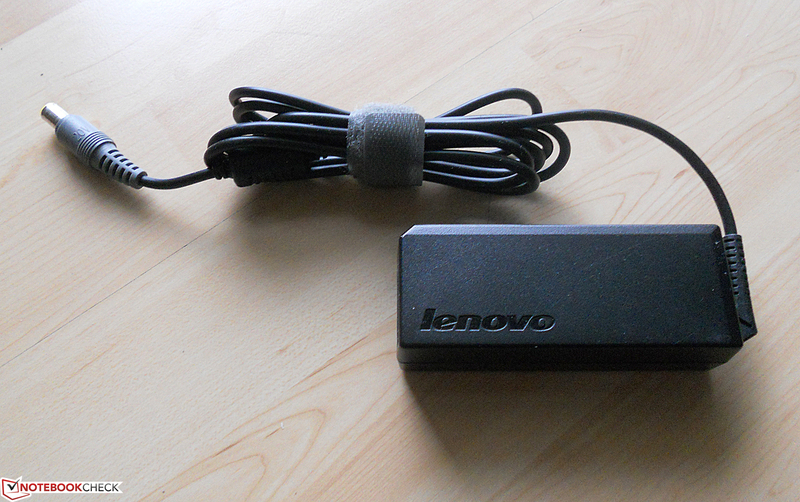 The business laptop's 65W PSU is one of the smallest of its kind. Lenovo's ThinkPad Edge E335 comes in a simple, rather unstylish box. A big gap is created in the base unit's back part when the battery is removed. The entry-level business laptop also looks good from the back. 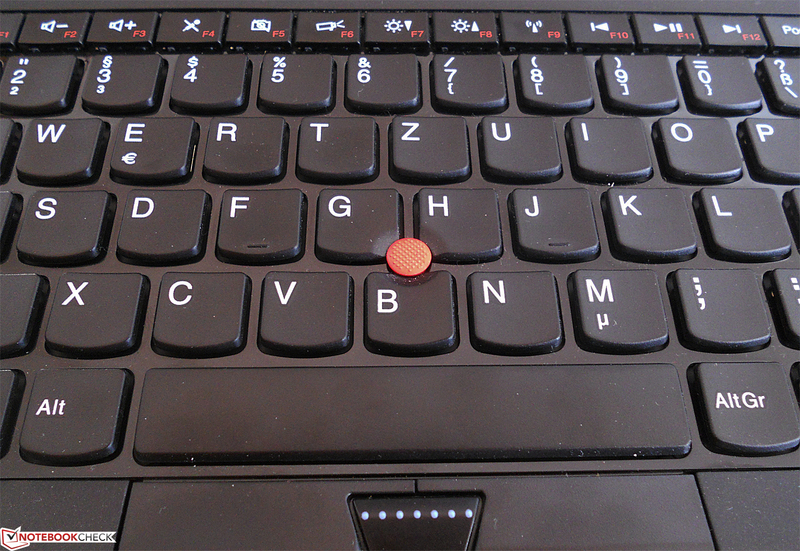 Newbies need to get used to the red trackpoint, but it is a must on a ThinkPad. but it is typical "ThinkPad". The E335's battery can be removed easily. The robust and good keyboard was impressive in the test. The ThinkPad logo's "i" lights up in standby. but is also susceptible for dust and fingerprints. The E335 is delivered with only few accessories. Lenovo's ThinkPad Edge E335 fuses a long battery life and a good keyboard in a robust plastic casing, as known from the model range. The low emissions also speak for the 13 inch low-budget business laptop. A bit more power would not have hurt. Only a bit! The E335's computing performance is so weak that any gaming or graphic editing intention is made impossible. The E335's noise emissions and temperature development are exceptionally low, particularly due to the extremely low performance.